» Win a Bottle of Purex No Sort! 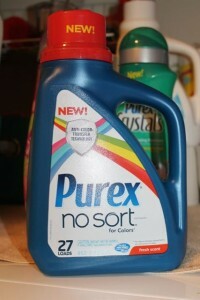 Home » Contest » Win a Bottle of Purex No Sort! Win a Bottle of Purex No Sort! Congratulations to Marge M. and Crystal P. for winning free bottles of Purex Crystals. Now for another chance to win a free Purex product…. Win a bottle of the new Purex No Sort Laundry Detergent! A great product for me since I haven’t bothered to sort laundry for years (that doesn’t always work out in my favor). Now it doesn’t matter. 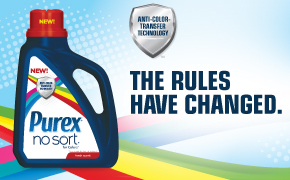 Purex No Sort is designed to prevent colors from spreading (a.k.a. Anti-Transfer Technology) by trapping loose dyes in the water and preventing them from settling on clothes. I have not idea how it works but so far, so good! Want to try it for free? Enter HERE now on my Giveaways page to win a free bottle! PLUS, you may also want to enter Purex’s contest to win $1,000 and a year supply of laundry detergent. Enter HERE by 5/9.